Occasionally, The Rug Cleaning Specialist turns its attention to some of the premier rug cleaning companies around the country, visiting several plants to see what makes them successful. 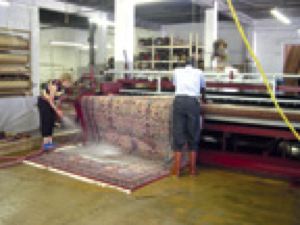 This month we take a look at Oriental Rug Cleaning Co. in Dallas. H.M. Amirkhan, Sr., was orphaned in Turkey at the turn of the 20th century. He arrived in the U.S. in 1908 at age 19, settling first in Cincinnati, Ohio and serving an apprenticeship with a cousin, H.H. Amirkhanian, to repay his sponsorship expenses. The company, Security / Amirkhanian, still thrives today. After completing his obligations and learning the craft of rug cleaning and repair, he moved to Texas and established Oriental Rug Cleaning Co. “Our rug cleaning legacy began in 1911 when my grandfather founded the company in Dallas,” says President Ellen Amirkhan. “By 1919, my grandfather was prosperous enough to construct a two-story building in which he lived and worked.” In 1926, a second building was added, increasing the square footage to 18,000. 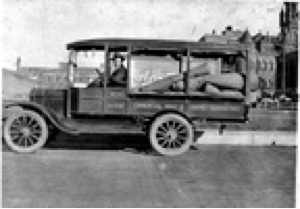 H.M. Sr. added rug dyeing and rug and carpet sales to the already established cleaning and repair services. In 1954, H.M. Jr. – known as Mirza – was admitted to the State Bar of Texas. Following the death of his father that same year, Mirza felt the pull of the family business and, with the help of his mother, Norma “Gracie” Amirkhan, took the reins. He spent several years on the board of directors of the National Institute of Rug Cleaning (now ASCR), and during the next 25 years he added carpet, upholstery and drapery cleaning to his business. 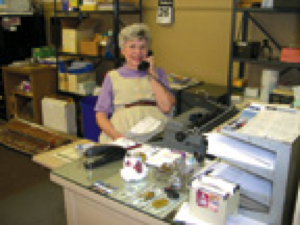 In 1976, his wife, Inez, came into the business to help temporarily; she will celebrate 30 years in 2006. In 1980, the couple’s daughter followed in her family’s footsteps, taking over as president of the family business. A graduate of Texas Woman’s University and Southern Methodist University, Ellen Amirkhan, a past president of ASCR, develops and teaches Oriental rug schools for ASCR, The International Society of Appraisers (ISA) and other recognized groups across the United States and England. In addition to instructing and appraising, she consults and serves as an expert witness for the legal profession. Her credentials include Certified Rug Specialist from ASCR, Certified Appraiser of Personal Property with a specialty in Oriental rugs from the ISA, and Certified Rug Appraiser from the Oriental Rug Retailers of America (ORRA). “Rug cleaning can be very challenging because the subject has so many variables and manufacturers are continually creating new types of rugs with their own special set of problems,” Ellen said. “This challenge is not an easy task but can provide a lifetime of fun, a sense of accomplishment, reward and satisfaction that comes with operating a successful business. “Our business has been successful over the last 95 years because of the family tradition of hands-on training and personally working with each customer to ensure their satisfaction,” she said. A fan of the hands-on approach to business, Ellen is on the wash floor daily. “I take pride that I can do each and every function of the business from rug washing and repair to payroll,” she said. “This is what makes a small business successful – the ability to perform, understand and execute all aspects of the company. This way we have continuity and consistency of service. We are cleaning the grandchildren’s rugs of our original customers. If we were not doing the job right and treating them with a high level of service they would not be coming back over three generations.